As PayPal prepares for its upcoming IPO as an independent eBay spinoff, it wants to make at least one thing clear: It's got mobile covered. platform for merchants, letting them incorporate a wider range of features into their payments services and improve the checkout process for customers. Many of the changes have been aimed squarely at improving the payment process on mobile devices. 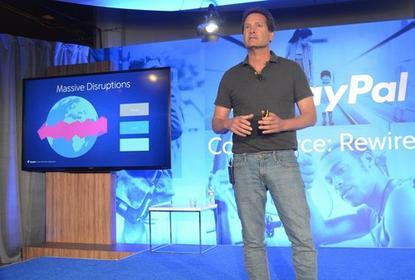 Roughly one-third of transactions processed by PayPal now come from mobile devices, PayPal President and incoming CEO Dan Schulman said Thursday during an event in San Francisco. In 2010, mobile was responsible for only about 1 percent of the company's transactions. The event served largely as a coming-out party for PayPal as it prepares in the near months to separate itself from parent company eBay. "We enter into the IPO with a considerable number of strengths," Schulman said. One of those strengths, he said, is the variety of payment methods, regardless of device, available to consumers through PayPal at checkout, whether it's via a debit card, credit card or loyalty reward points. Some of the more popular Internet upstarts, including Uber, Airbnb and Hotel Tonight, use PayPal's technology for processing payments inside their own apps. During the event, PayPal announced an expansion of its One Touch system, which lets consumers pay for products without having to re-enter their payment information. Previously, the technology could not communicate between devices. Now, when consumers first enter payment information on a desktop computer and then purchase an item on a smartphone, they won't have to re-enter payment details, even if they don't have the PayPal app installed. The linking takes effect Thursday starting in the U.S.
PayPal executives also announced a new partnership with Bigcommerce, which provides e-commerce services to online retailers. The partnership will let more than 90,000 merchants that use Bigcommerce incorporate PayPal and its Braintree payments system into their businesses. Still, PayPal faces competition from a growing number of other players. Stripe also lets businesses accept payments over the Internet, and large social networks like Facebook and Twitter are pushing features that let their users either buy products or track their orders through their sites. PayPal has also stumbled. This week, the company was fined US$25 million by the U.S. government for signing up people for Paypal's credit service without their permission. Earlier this year, the company was fined for ignoring U.S. sanctions and allowing money transfers to accounts linked to Cuba and Iran.